The printed page is a pleasure to behold. Your Democrat Printing Account Executive serves as your single point of contact, coordinating your entire printing job from prepress to distribution. Your Account Executive is just a phone call away, providing personal attention and direct responsiveness 24 hours a day, 7 days a week. Considering something different? Your Account Executive is always ready to answer questions and offer guidance. Let our team of experts explore the possibilities we offer to make your project shine. For more than 140 years, Democrat Printing & Lithographing Company has offered quality printing services. Over the decades, our family-owned business has grown with the times and kept abreast of the many changes in technology and services. Established in 1871 as the commercial printing division of the Arkansas Democrat Newspaper, in 1906 we became DP&L – a separate entity – in downtown Little Rock, Arkansas. During the next 40 years, we prospered as a high-quality sheetfed printer. 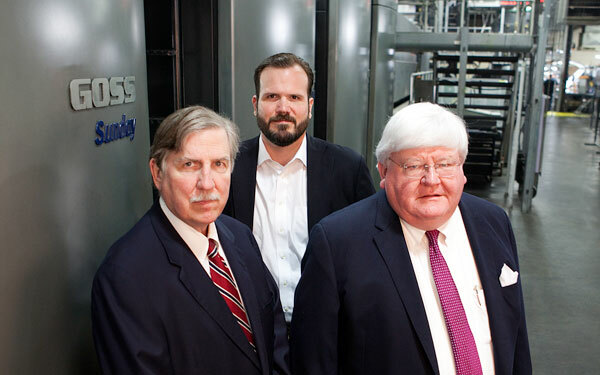 1968 saw expansion into the web market with the addition of web presses, automated bindery equipment and a new production plant in the River Port area of east Little Rock. Our plant currently occupies a 126,000 square foot facility preparing, printing and binding over 220 publications and catalogs. Democrat Printing offers services including heatset web printing, sheetfed printing, binding, stitching, mailing, warehousing & special orders of a range of printing grade papers. With 99% of work processed via online submission & approval, Premedia & platesetting features Agfa Apogee as well as Avalon VLF platesetters. It is with great enthusiasm that we look forward to offering our customers the best that the digital age has to offer, while maintaining the qualities that built our reputation.